Thus, the raison d’être for this paper is first to examine a very peculiar land division in the Commune of Assier (46320), and then explain its re-appearance in neighbouring communes utilizing precisely the same type of landscape, mauvaise terre. This landscape is part of the Parc naturel regional des Causses du Quercy with adjacent communes. Its creation and demise are the history of the region for both the inhabitants and farming. An original text in Quercy Recherche no 130, ff 33-45 was the instigator of this research. Le raison d’être pour cette texte a la premiere est á examiné d’un plus curieux divisé de la terre du commune d’Assier, et puis expliquer la réapparition á les communes á côte d’Assier, utilise exactement la même chose de paysage, mauvaise terre. Cet paysage est une partie du Parc naturel regional des Causses du Quercy et communes limitrophe. Il est création et mort sont l’histoire de la region pour l’habitant et fermiers. Une texte originale, Quercy Recherche No 130 ff 33-45 etait l’instigateur de cette texte et recherché. The landscape of the PNRCQ varies considerably. It is basically Jurassic limestone pavement containing cloups, prés and vast fields of crops. There are, indicated upon six IGN 1:25000 Cartes de Randonnee, from Vallee de la Dordogne to Figeac and Cahors thirty three noted mentions of La Deveze or La Garrigue. Thus we may infer this descriptive title signifying “mauvaise terre” was well known in the ancient regime. But many of the La Deveze/Garrigue areas are now heavily wooded lands, although by scrub Oaks etc., such as La Forêt de la Braunhie within the PNRCQ. From this we can learn of the gradual demise of the open land or farm land to wooded areas. But this is not atypical. That La Deveze or La Garrigue is definitely mauvaise terre, can be inferred from the signs placed alongside the autoroute to Montpellier. They state, “entre les vignes et la garrigue”, and illustrates adjacent vineyards and scorched stony ground! This is basically La Forêt de la Braunhie. There is also a small area on carte 2137E west of Issendolus adjacent to the Chemin de Fer. The largest sub-divided areas are at Caniac du Causse and Villeneuve d’Aveyron. The land areas with this peculiar sub-division at Livernon and Ambeyrac are practically identical in size and shape. However, the land in the Forêt de le Braunhie illustrates some of the most fanciful and strange sub-divisions. Note; L’Hôpital-Beaulieu is at Issendolus, 46500, which is NE of Caniac du Causse. 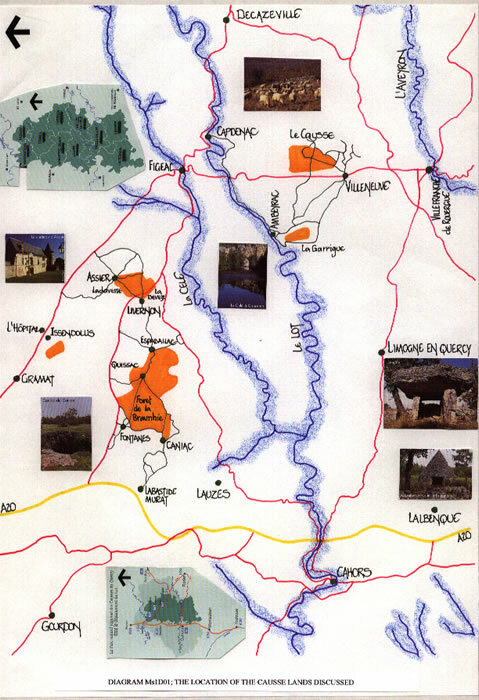 To answer the question of ‘l’origine’ it is first necessary to explore the other land areas at Assier/Livernon, Ambeyrac and Villeneuve d’Aveyron. 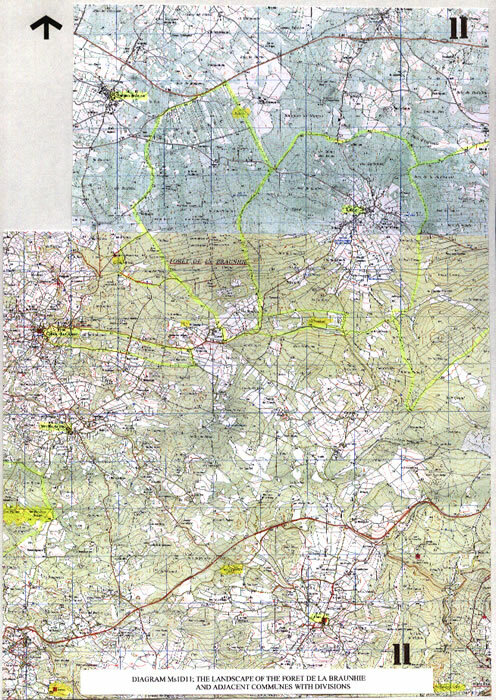 Within the pages of Quercy Recherche No 130, there is an attempt to explain the land division visible south of the village. Undoubtedly, as a strange and non-French method of land division, it requires explanation. The Q. R. 130 paper was << une hypothese personelle par l’auteur>> and may also be considered a plea for the expansion of the registration commenced by Prosper Merimee, Inspector of Historical Monuments, when in 1842 the ruins of the Chateau D’ASSIER, constructed by Galiot De Genouillac, were included. This author concurs with that plea, but does not see such a grandiose idea in the landscape of Ladevesse. 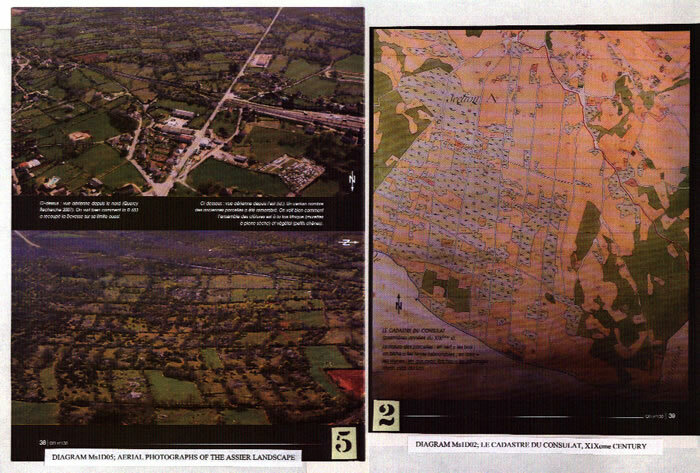 However, the actual solution places ASSIER in the forefront of special land sub-division and measurement, as is shown by the text and diagrams. 2) He travelled through Italy, south at least to Naples. The Ladevesse appears to be bounded by the chemin rural d’Assier a Bresquejouls (east); the chemin rural Figeac/Livernon (south) and Le Bourg d’Assier (north). The rectangular land division is central to this area and appears to fade away towards the eastern limit of the commune. This may be the consequence of a loss of enthusiasm for a continuation of an overbearing scheme rather than the design intent of the originator. 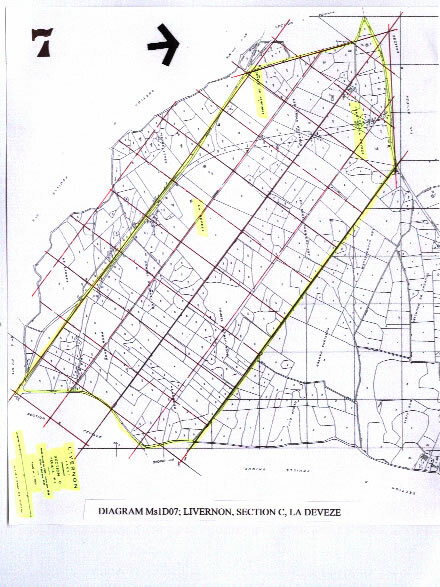 However, a study of the XIXeme Cadastre du Consulat indicates that from the supposed western boundary in section B, the chemin rural de Livernon, there are in fact six more large rectangular land divisions (which can be easily recognised) to the limit of Section A in the north-west. Voir plan d’Assier, c1803. 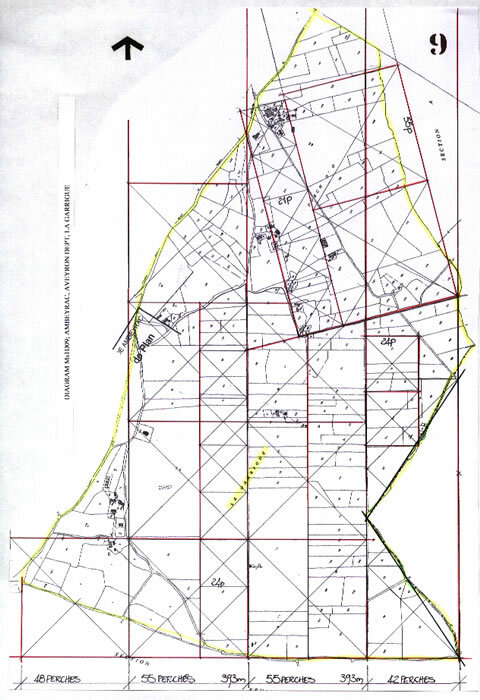 But, Section B in the south-east quadrant also indicates large rectangular divisions and would appear to align with the south-west section across the village of Assier, thus forming a north/south boundary. This point is discussed later in the text. The landscape works we are studying no doubt required immense enthusiasm and/or very deep pockets to sub-divide what may be considered scrub land of no value. A stroll along the chemins, which with the limestone outcrops is not always easy, will indicate to all that there is very little land of consequence. It will also indicate that the limestone pavement of the chemins has suffered little, if any wear and tear, from centuries of cart wheels. There appear to be no ruts whatsoever. However, these chemins vary from c3.5m to c2.0m in width, why? What required such wide tracks? In a landscape where large crop fields abound and at harvest time carts would require to pass each other, perhaps there is a reason. But this is grazing country, Causse Brebis, and they are easily driven along narrow tracks with simple gates for field entry which fold back across a chemin to form a barrier. Wide tracks are for military action; men abreast to move quickly in formation and wheeled transport with cannon carriages. Examine your local chemins, they wander hither and thither, but later roads in the landscape, generally military for control of the populace are like the ancient Roman Roads, straight from point to point. A walk around the Ladevesse will also indicate the amount of limestone pavement at or above the normal surface level. Study the Cadastre pre XIX siecle; there are very few areas shown supporting Vines or cash-crops. It is virtually all grazing land. Why therefore has so much time and effort been spent upon the original layout, and just what was that original format? There are curious anomalies in the construction of the murettes. At junctions of walls to main chemins, the wall is curved into the field area and then returns by an opposite curve to the original alignment. This is as if to create space in the chemin and strengthen the junction. Why? What was going to damage the wall? Why was extra strength required? There is also a second anomaly in the wall construction, the triangular corner, well constructed in solid masonry. These are based upon a side length of c3metres, a massive wall. Did a few sheep grazing scrub land require that the walls be so strengthened, or is it the manifestation of land clearance using the limestone to provide a base, albeit rather large, for a Borie or Cazelle atop the wall. There is plenty of debris to allow for the later walls to be constructed using the robbed out stone. If the Ladevesse was laid out in c1535, (Chateau, c1530 and Church c1540) then the first Cadastre is 250 years out of date and the latest cadastre virtually 500 years later. In the first 250 years, were there no changes? A negative response here is inconceivable! The change from c1800 to c2000 can be accounted for by the land re-distribution and the disastrous effects of the Napoleonic Code of Inheritance which has land being subdivided ad infinitum. Therefore to consider the 600 parcels now indicated upon the plan cadastrale is unhelpful, when there were only c150 parcels in c1800. But, how many parcels were there in c1550 after the death of Galiot de Genouillac? We can only guess. The landscape indicates where walls have been built later, particularly in the south, and a comparison of Cadastres indicates the re-use of older walls to form the landscape of today. But does the obvious parallelism of the outer limiting walls indicate a totally different level of competence in surveying and building to the possible mis-alignment of the inner walls and therefore chemins. It would appear so, and thus we may surmise a later construction date for the general interior walls. The Romans instituted the gift of land to Citizens of Rome and retiring Legionaries. The area was, 4 Acti Quadrati= 2 Jugera= 1 Heredium of land, respectively, 120 x120: 120 x 240 and 240 x 240 Roman Pedes. These are the equivalent of 35.5 x 35.5: 35.5 x 71 and 71 x 71 metres respectively. Thus we can surmise that Galiot returned to France with the Roman landscape of Italy firmly memorised. But can we prove that fact? I think it is very probable. Consider this fact. The King of France instigates a measure based upon the Roman Pes. The King of France in question is Francois 1er, King to Galiot de Genouillac. Did Galiot return from Italy and convince the King to instigate this new measure named the L’ AUNE, from the Latin ULNA, the arm bone. Thus we may infer that Galiot not only took the idea of an Italian renaissance chateau to use for his own, but, instigated and probably built it all using l’Aune of four Roman Pedes as the unit of measurement. It is also worth noting that the Roman land measure converts perfectly to the measure of l’Aune, at 30 x 30: 30 x 60 and 60 x 60 Aunes respectively. We also find that the Roman Pes (plural pedes) was still used in France as a unit of measure in the 12eme century. Even the great monastic house at Cluny is built using a 1 ½ pedes basic dimension. The dimensions utilised in this investigation are fully explained in appendix 1. The apparent uniformity of Ladevesse indicates that the original form was set out by a Geometre, but afterwards constructed in a piecemeal manner. 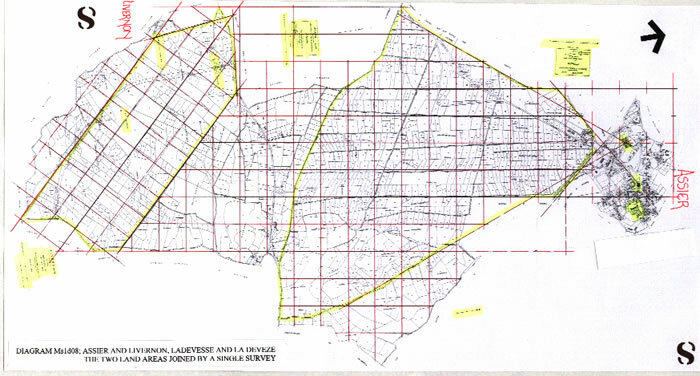 It is therefore necessary to apply survey techniques to the existing Cadastres to retro-survey the area and arrive at a ground zero with all measurements known and co-ordinated. There are two parallel chemins within Ladevesse, probably the originals, which can be used as base lines for the exercise. The east; Chemin de service dit du Cloup de Louver et du Cloucan; and in the west, Chemin de service dit de Crosepisse et de Marayrade. They are respectively 2180 metres and 1750 metres straight length. Both then, at their northern extremity, incline inwards towards Le Bourg. The other or southern boundary is to the commune de Livernon, it is 1040 metres. This is the major sub-divided land area and it forms a rectangle with a triangular apex. The rectangle is c880m wide and 2540m long with a c360m triangular extension. This section is also sub-divided by three major chemins giving quarter sub-divisions of c220 metres. But Francois 1er instituted l’Aune of 4 Roman Pedes. Thus c880/220 metres may be fairly converted to 3000 Roman Pedes/750 Roman Pedes or 750 Aunes/187.5 Aunes. The precise measure is 888/222 metres. Thus we are able to draw a complete graticule of lines at c220 metre centres to examine the whole of Ladevesse and confirm these findings. Using the south east corner as a base point, squares of c220 x c220m are drawn and prove that a coincidence with other points in Ladevesse is startling. The south-west corner of the original rectangle is precisely marked even though it is two squares north, and the other south-west corner ( now the V. C.) is again precisely marked a further three squares west and two north. 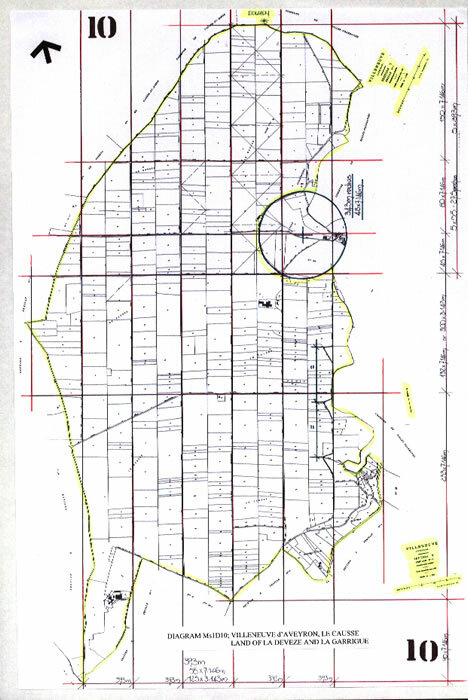 But when the parallel lines to the original chemins are drawn on the plot in a northerly direction, the centre line is coincident with the Cemetery. When Knights in the middle ages, the Crusades, and from the period of Chivalry died, they considered that having fought for Christ or lived a virtuous life they would ascend via their earthly grave to Heaven. Thus many cemeteries were called <Paradise> and we should not be surprised that a cemetery is used as the base point for such an enterprise. Galiot de Genouillac was closer to the period of Romantic Chivalry with its literature and morality than we are to the first Cadastre we have been studying. It would have been part of his heritage as a Knight. Hence we find that by using the 3000 Roman Pedes or 750 Aunes dimension, when we draw the final plot from the south-east corner, thirteen squares north we locate the Church of Assier, Galiots burial memorial, covered in carved cannons. The chemins are therefore generally 12 Roman Pedes/3 Aunes (3.55m) wide and the smaller chemins are 7 Roman Pedes wide (2.071m). To further this argument, parallel lines can be drawn to the east and west of the main area. These indicate the full extent of the original survey. Thus the overall plot of Ladevesse is not controlled by the position of the Chateau of Assier, or even the Church. It is controlled by the Cemetery position and the southerly projected centre line. And now a landscape peculiarity arises. The overall form of Ladevesse from this point is a symmetrical construct. It takes the form when viewed on a plan of a Church cross section. There is the nave roof profile, and the side aisle roof profiles. Did anybody realise that Galiot de Genouillac had a sense of humour, because it is practically impossible to discover such a construct upon a natural landscape unless it was there in the first instance. And, from following the survey data as it unfolded on the landscape, it now appears to extend into the Commune de Livernon. Why should it not do this? Those boundaries did not exist in c1535. From the Cemetery at Assier, the centre line is set out and then four simple triangles are surveyed on the landscape. These have side values with a 3:5 ratio and are part of a Pythagorean triangle. Set these out, and the apparent Ladevesse southern boundary is perfectly delimited on the chemin between Assier and Livernon. The whole survey area of the badlands, la Deveze, is actually a land division that encompasses all the exposed limestone pavement of the two communes. It no doubt commenced in the north at Assier and through the norms of survey setting out was extended to the area of Livernon. The survey work is exemplified by its simplicity. Assier is three squares which link to the Livernon area by the simplest of survey tools, a 3:4:5 side ratio Pythagorean triangle. The Livernon area is then two squares. But, both have a triangular head of matching dimension. If the Livernon Deveze is drawn over the Assier Deveze, then the correspondence of the landscape forms is spectacular. They are one and the same survey, as diagram 8 indicates. Thus we may infer that Galiot De Genouillac owned all of the land we are discussing, or, had influence over its sub-division. That is of course if this is a 16eme siecle phenomenon. The Chateau of Assier is in the north-east quadrant of the village. The land here is more fertile and suited to farming properly. Here Galiot sited his Pigeonnier for 2300 birds, described as a c12 metre (40 Roman Pedes or 10 Aunes) high tenement block with 2300 varnished nests each representing a division of his land. A painting by Gaignieres, 1680, shows the chateau as it was with gardens to the north and east. The existing section is to the forefront of the painting. Thus did our braggart chose to sacrifice the horrible ’Causse’ land to the south, to infer his credentials as a modern renaissance man, by sub-dividing the land in a similar manner to the ancient Romans. That the landscape was physically altered by Galiot de Genouillac is not in doubt. Perhaps his motives were not as altruistic as we at first believed. Ambeyrac was partly formed from parishes adjoining including Montsales. It is on a plateau south of the river Lot, and has c167 inhabitants. The divided land at Ambeyrac is named “La Garrigue”, and it is an excellent descriptive noun for the landscape. However, this land division provides adequate proof that there was a melange of measures, with the Arpent of Toulouse and the Arpent d’ordonnance in its central area. There we find the measure of 393m or 125/55 perches and side divisions of 171.5m or 24 perches d’ordonnance of 7.1465m. But the Arpent de Toulouse is 24 x 24 perches and the Arpent d’ordonnance, 10 x 10 perches, ie 75.432m per side and 71.465m per side. The unit of one is transferred mathematically to the other. Thus the length of the land is 150 perches or 165 perches, which are 3 x 55 or 3 x 125 perches. Unfortunately later landscape adjustments have disrupted the northern portion and it is not possible therefore to make a definitive statement. However, if we overlay the Ambeyrac plan over the Livernon plan the landscape correspondence is remarkable. This indicates that there was a desire to ensure all such mauvaise terres were treated in the same manner. It could also indicate that the land distribution followed the revolution of 1797. The land division at Villeneuve can then be described as having five major parts in its length; 200; 3760; 3300; 3150; 3760 short pieds and has also the 24 x 24 perche of 7.1465m, the melange of the Toulouse and Ordonnance Arpents. The sub-division of the land is rectangular and precise! The Braunhie stretches over 2600 hectares and occupies part of the communes of Caniac de Causse, Quissac and Fontanes du Causse. The land is sub-divided in various forms; at Quissac, centred upon the village is a curious radial land division which has its origins indicated upon the Plan Cadastrale of 1803, but the landscape is mostly woodland and thus the division we now see on the IGN cartes is of a later date, perhaps hinting at a continuity of an original planning ideal. This radial division extends in an east/west format towards Espadaillac and includes the western part of that commune. Thus the division was made under the ancient regime and carried forward in a similar manner after 1797 and no doubt under the Consulat. The landscape of Fontanes du Causse, the northern part of La Braunhie, is sub-divided perpendicularly to the communes limit at Cartayroux, the ancient chemin. The landscape within the commune of Caniac de Causse however exhibits the basic sub-division of the previously entitled areas, Ladevesse, La Deveze and La Garrigue. There are 220m and 330m divisions, ie 70 and 105 perches of 3.143m as well as slightly larger divisions of 350m and 420m. But this landscape has been much altered as the texts by ENS du Lot indicate. There is a central north/south chemin which is as sinuous as a snake, whereas the adjacent and perpendicular chemins are straight! Due east of the village of Caniac, at Les Bouygues, there are parallel east west chemins, 393m or 55 perches of 7.1465m. At Les Devezes, south of Quissac, on land east of Les Bouygues there land tapers from 393 to 343m or 125/109 and 55/48 perches. The land division at Assier is unique, perhaps for being the first of its kind. But as has been shown, it is certainly not the only peculiar sub-division of Causse land that can be found in this most interesting of landscapes. Unfortunately we do not have all of the Plans Cadastrale of communes within the PNRCQ as is discussed in their publication ,>> Theme No9, Les plans consulaires ou cadastres par masse de cultures<<, therefore we must use the IGN maps to identify the areas and perhaps theorize more than is desirable on the phenomena’s origins. But, Ladevesse, La Deveze and La Garrigue are one and the same, mauvaise terre, subdivided to provide farmland for a very large population. It cannot be over-stressed just how populous France was until the 19th century. It was the most populous country of Europe with c25 million inhabitants (England had only c6 million then), and this fact accounts for the necessity to utilize even the poorest of land for food production. After the revolution of 1797 when there was a land distribution and Parishes became communes, with boundary changes to match, we can see those changes in the land forms spreading across boundaries. 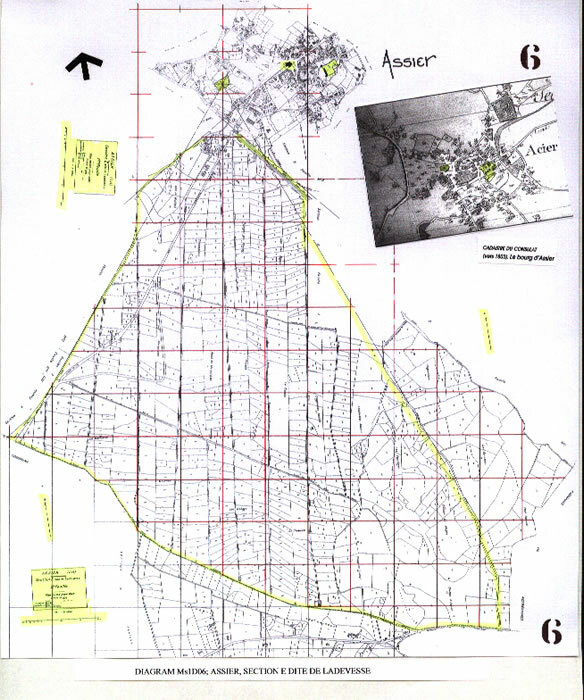 With the onset of the Napoleonic period and the inheritance codes, the Plans Cadastrale indicate the change in ownership with smaller plots as at Assier increasing in number from c150 to c600. Then no land could be left uncultivated or unused, hence we see the expansion of Ladevesse, La Deveze and La Garrigue. Elle commence a partir des annees 1880 a cause d’une depopulation qui voit les valets de ferme et les journaliers partir vers Decazeville(12300). Des lois socials reglement le travail des enfants, l’obligation scolaire s’installe. Les plus petites exploitations agricoles disparaissent. A partir de 1878, le phylloxera arrive en Quercy. Les vignes du Causse et le vignoble de coteaux sont detruits, les clotures souvent laisses a l’abandon. Apres la Grande guerre, on construit peu de murets. On entretient ce qui existe. L’usage du fil de fer barbele se generalise. A partir des annees 1950, l’arrivee du tracteur et celle d’un materiel agricole prevu pour de grandes surfaces entrainent la suppression des murets, facilitee de nos jours par la generalisation de l’ursus (grillage a grosses mailles carrees), des clotures electriques et des casse-pierres (machines qui concassent les pierres)<<. Donc nous avons la réalité, quand il y a la population et nourriture est peut-etre peu abundant, puis la terre mauvaise est utilise. Mais immediatement c’est possible a departe de cet terre, terre cet est trés dur pour les habitants, il est abandonée. Deux cent années d’utilisation seulement, et maintenant il est pour les touristes! 7) Horace Doursther, Dictionnaire universel des poids et measures, Brussels, M. Hayez, imprimeur de L’Academie Royale, 1840. 8) Espaces Naturels sensibles du Lot, par Conseil General du Lot. 9) PNRCQ. Theme No7: Les usages juridiques locaux dans le PNRCQ. 11) La Federation Departemental des Chasseurs du Lot, Cahors, 46004. Brochure; Inventaire, Diagnostic et Rehabilitation des Cloups et points d’eau des Causses du Quercy. 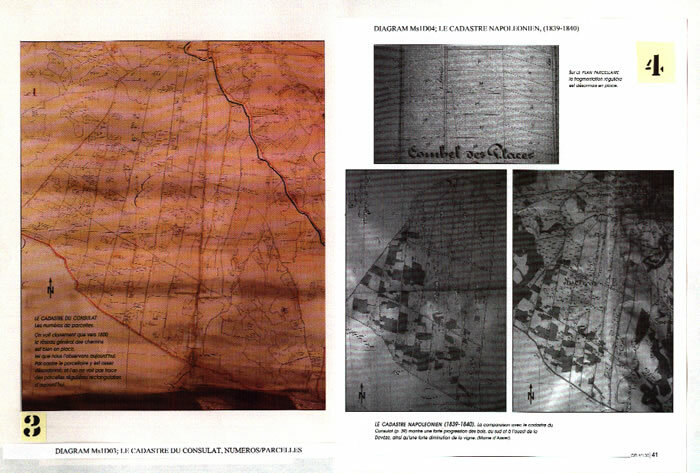 12) Les plans cadastrales obtenir de les mairies d’ Assier, Livernon, Ambeyrac et Villeneuve d’aveyron. Merci pour votre assistance. Note; the publications by PNRCQ are available on line at www.parc-causses-du-quercy.org. Address; 11, rue Traversiere, 46240, Labastide-Murat. 17) Tables de Comparaison entre les Mesures Anciennes et celles qui les remplacement dans le nouveau systeme metrique avec leur explication et leur usage, pour le department de la Haute-Garonne. Publiees par ordre du Prefet, a Toulouse. The land we are discussing, QUERCY, an ancient land carved by the rivers Dordogne, Cele, Lot and Aveyron which delimit the Causses was originally part of the territory of the Counts of Toulouse, who with other members of the family were also at various times Counts of Quercy, Rouergue, Albi and Nimes and Margraves of Gothia and Provence. Thus we must examine the ancient land measures of this area to establish what may have been utilized by the ancient regime. There is one obvious measure, L’arpent de Toulouse. L’arpent de Toulouse ou seteree = 576 perches carrees de 14 empans de cote = 1764 cannes carrees = 112896 empans carrees, et, L’arpent ou seteree de 1152 perches carrees. NOTA; le deuxieme arpent n’est pas deux fois le premier, c’est en fait deux carre de 576 perches carrees, côte a côte, la meme chose a L’Acte Romaine quand il est La Jugera, deux Acte côte a côte. Dedans ces mesures il y a une superficie de la terre, La Seteree, le numero des perches carrees une volume de la graine peut semer. La seteree basee en La Setier de la Graine, maintenant equivalent de c152,3 litres, etait aussi 12 Boisseau (c12,7 litres) quel est definir par 10/27 du cubic pied de Roi, ie 640 cubic pouces. Le Boisseau, mesure de la graine, est la derivation du Boiselee, un mesure carre de la terre. La data suivre est attributable. et, 600 boisseaux font Le Hufe. Thus we have a measurement, L’Arpent de Toulouse and a land utilisation ratio with which to judge the peculiar sub-divisions of the various Causse areas. There is also another measure that may be applied to this landscape, The Arpent. << En France, un Arpent valait 10 perches d’arpent soit 220 pieds du Roi egale 71.46m; l’arpent des arpenteurs.>> The Pied du Roi is 324.8mm and the Roman Pes is 295.835mm, an expansion of 1.098 or 10 per-cent. Thus we can fairly dismiss this surveyor’s measure as the basis for the setting out of La Deveze. There are many other landscape measures used during the period of the ancient regime, but none of them accord to the basic dimensions of La Deveze. Galiot de Genouillac has used the Aune that he perhaps craftily inveigled Francois 1er to agree as a French measure.